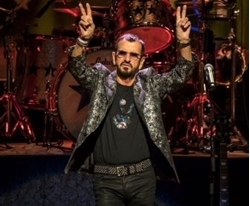 Ringo Starr headlines lovefest at NJPAC (review with setlist, videos and photo gallery) . Beatles Radio: The Beatles, Solos, Covers, Birthdays, News The Fab 4 and More! Looking svelte and stylish and decades younger than his 77 years, Ringo Starr brought his All Starr Band to NJPAC on Nov. 16 for the final concert of their 2017 tour, and did what’s he’s always done best. No one ever mistook the former Richard Starkey for a great singer, just one whose deadpan nasal glumness could add character to a song. Almost all of his biggest hits bear co-writing credits from his famous friends. U.K. comic Jasper Carrott once joked that he wasn’t even the best drummer in the Beatles, a quote that rang so true it wound up being attributed to both John and Paul. To paraphrase Winston Churchill, never has a man done so much with so little for so many. Because, let’s face it, everybody loves Ringo. And he knows it.